In June 1942, forces of the Japanese Northern Army occupied Attu Island as part of its Midway campaign. Attu, at the far western end of the Aleutian Archipelago, was American soil. 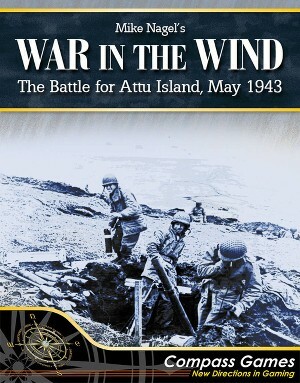 In May 1943, American forces landed on Attu to liberate it. They were unprepared for the tenacity of the Japanese defenders and the brutality of the environmental conditions. What was expected to be a week-long clean-up exercise became a month-long, nose-to-nose meat-grinder whose casualty levels would not be exceeded until Iwo Jima. War in the Wind is a low-to-moderate complexity game (roughly eight pages of rules) depicting the brutal combat and conditions on Attu. The design focuses on the challenges faced by the American forces in the form of extremely variable weather conditions and logistical hurdles posed by nearly insurmountable terrain. The Japanese must use these conditions to their advantage in order to survive the overwhelming American numbers. In addition to the campaign game covering the entire battle, War in the Wind also includes three smaller scenarios focusing on separate phases of the battle.